I’m Nicole Peters and I’m enrolled in the Advanced Diploma in Geographic Sciences program at COGS. Recently, a group of us attended the Esri Canada User Conference in Fredericton, and I would like to share some insights on both the structure and content of that conference. It was my first Esri conference, and as such is a bit different from the other (mainly geology) conferences I have attended throughout the course of my BSc and MSc programs. If you are thinking about going to one of the User Conferences and aren’t sure what to expect, I hope this will help you decide! The Plenary and Technical Sessions gave details on new and existing features, as well as some of the upcoming and beta features, in the case of the Plenary Sessions. There was also a lot of information on the development direction and some of the priorities for what’s next for Esri. While specific examples are given during these presentations, I found the focus was on detailing the capabilities of the various programs and tools. The user presentations focused on specific applications of the Esri technology, and in some cases, how this implementation of technology has benefited them or their company. I was excited to learn about the further development of the alliance and interoperability between Autodesk and Esri, which gives me hope for future integrations with other specialized software packages as well. Many times, getting spatial data out of a processing or analysis program and into ArcMap (for example) can be a challenge – a csv just doesn’t cut it sometimes – and I’m glad to hear that more work is being done on this! I was also excited to learn more about two different data collection apps – Survey123 and ArcGIS Collector. I attended a technical session which did a deep dive into Survey123, and showcased the ease of use for both the designer and the data collector or participant. There is great flexibility in survey design and data collection methods, and I can see this being widely used due to both this and the cross-platform nature of the app (mobile app, desktop, browser-based). Collector was mentioned in many of the Esri-led and user-led talks. It is a very powerful tool which allows you to easily collect and manage field data, either in realtime or after syncing data, which makes it quite useful for remote areas or other areas without enough infrastructure for realtime data links. As for the conference itself, it proceeded in true Atlantic Canadian style with ample time for food, refreshments and socializing before and between sessions and talks. This also allowed the students and other attendees to not only make connections, but also take in the Solutions Expo and speak with some of the vendors who had booths in one of the rooms. 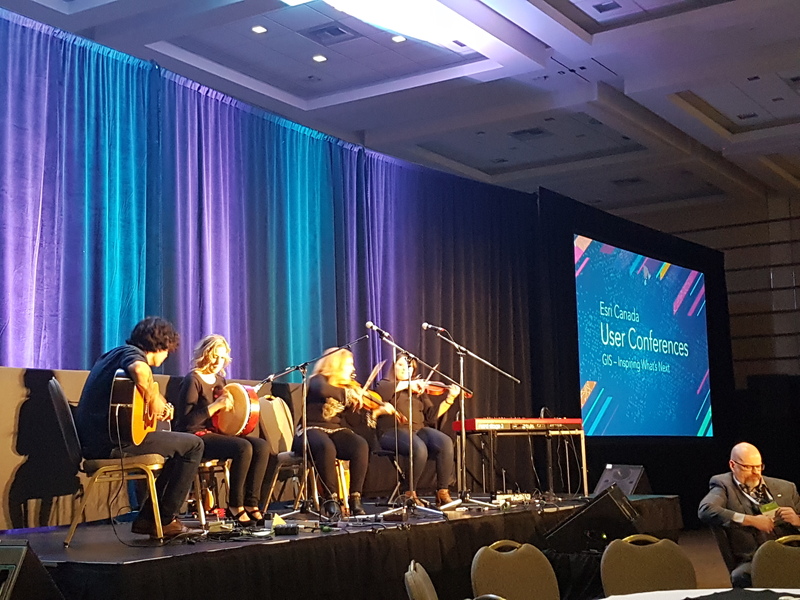 As this User Conference was a 2-day affair, we also had a great evening of networking, food, and music. On that note, I will leave you with the entertainment!